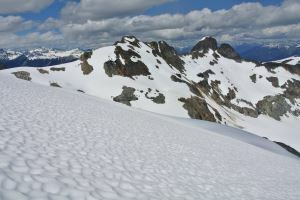 A twin summit located on the north edge of Nivalis Glacier, near the eastern boundary of Garibaldi Provincial Park. The two summits are nearly identical in height although the southwest one may be slighly higher. Access is via logging roads that run up from the Lillooet River. Gain a northeast-pointing ridge and follow it to the Nivalis Glacier. Both summits are easy scrambles from the glacier.